The gorgeous new St. Pancras Church Garden is surrounded on three sides by tall buildings, making it feel a bit like a secret garden. It’s paved with large stones in an interesting herringbone pattern, and it is filled with diamond-shaped planters and mature trees. “We imagined that the lost church, left alone for so long, had been allowed to grow new shoots and re-emerge as an untrimmed and happily rambling pewlike species,” explains architect Miria Smith in a statement. The furniture in the new park was handcrafted from oak by the Historic Carving department at the City & Guilds Art School in south London. Some of the hand-carved pews look like ruins, and they depict Medieval scenes, while also adding function to the new public space. In 1666, the Great Fire of London raged through the English capital, destroying thousands of homes and 87 churches. Among the churches that burned was St. Pancras Church, which dated back to the 11 century and was never rebuilt after the disaster. Now, almost 350 years after the fire, Studio Weave has transformed the site of the former church into a vibrant urban garden that opens the space to the public for the first time since the church burned down. 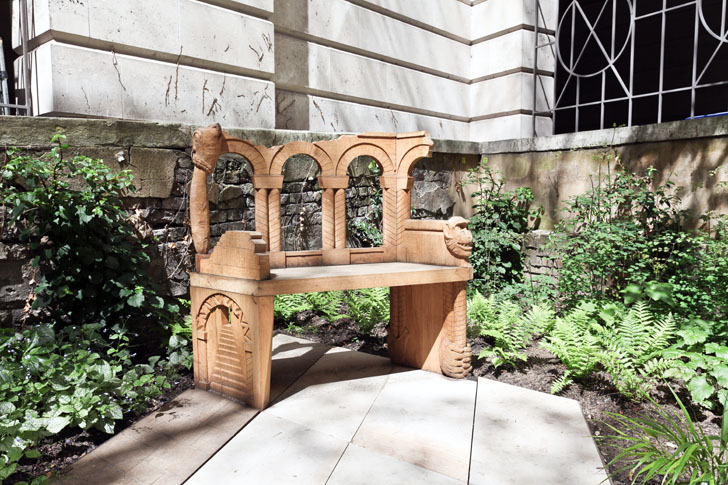 The furniture in the new park was handcrafted from oak by the Historic Carving department at the City & Guilds Art School in south London.